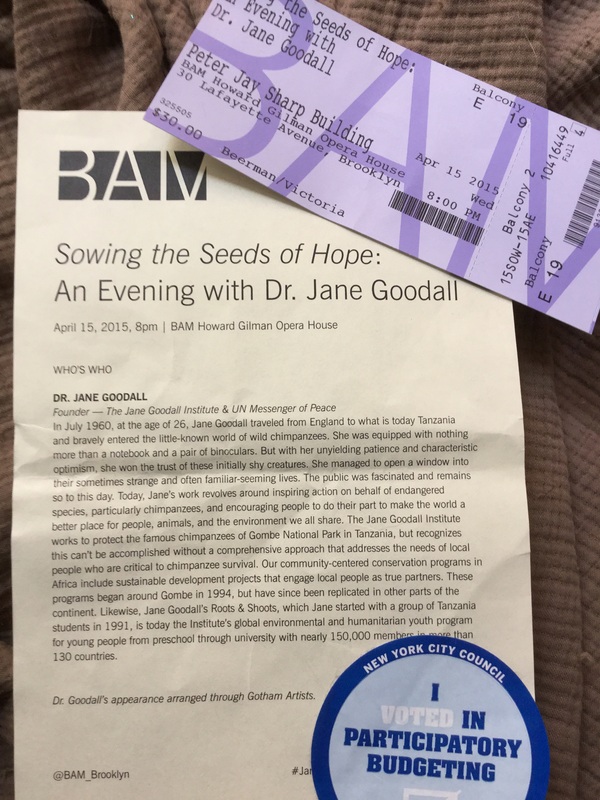 I spent a lovely evening at BAM hearing Dr. Jane Goodall speak about her life and her work. I was hoping she would speak about her childhood and the path that lead her to where she is now, and she did. It was very inspiring. Her mother encouraged her interests from a very young age, and whenever there was an opportunity, Dr. Goodall took it and used it to create the life she always imagined she’d have. She is the embodiment of “take what you have and make what you want.” Hearing her speak of her work with the chimpanzees of Gombe National Park in Tanzania, and watching the videos she showed of some of those experiences, touched me very deeply and often brought tears to my eyes. Her work with youth around the world in her Roots & Shoots program is the perfect example of how all of us, working together, really can make a difference in our world. It was a real privilege to hear Dr. Goodall speak. I felt hopeful and empowered. Not long after, I was voting in my community’s participatory budgeting process and felt that same sense of hope and empowerment.